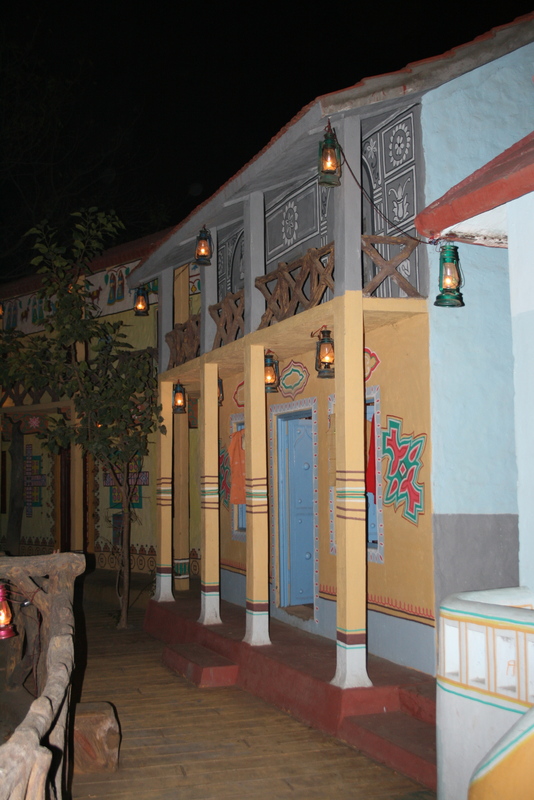 and then go off to explore at Chokhi Dhani, an ethnic Rajasthani village. 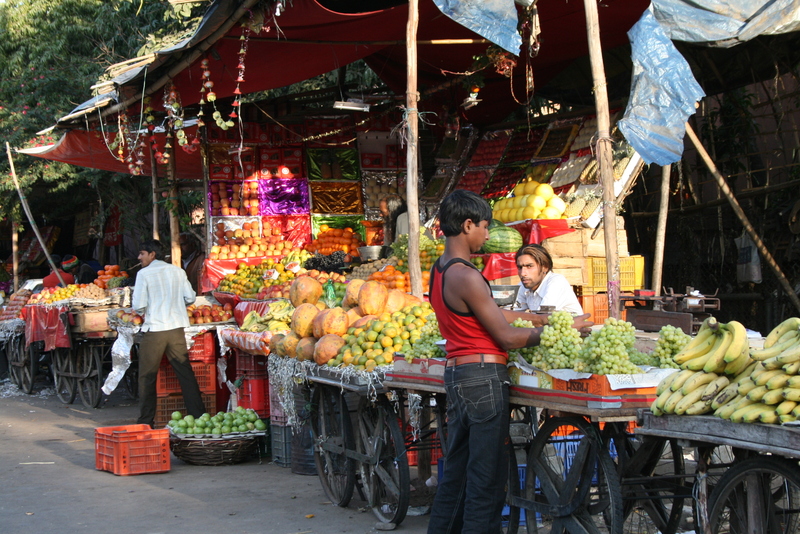 The village is a a working one with a miniature version of the entire area of Jaipor. 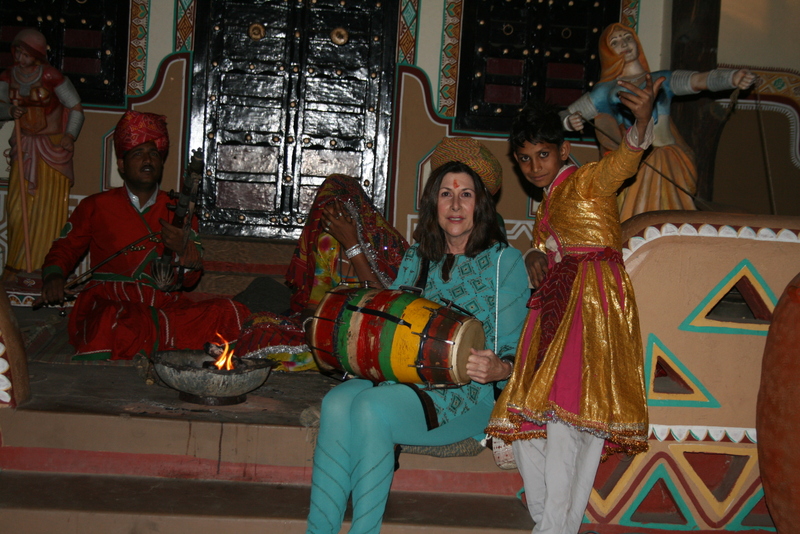 Families perform dances and music, magic, palm reading and there is a shopping area lit by torches,each “shop” is beautifully painted with typical Rajasthani art. The people of this region are rich in culture and their royal heritage. their dress is colorful and ornate and their dances defy gravity and coordination. I am delighted. As one enters the village you are showered with flower petals, your forehead is painted with the ethnic colors of red and yellow. 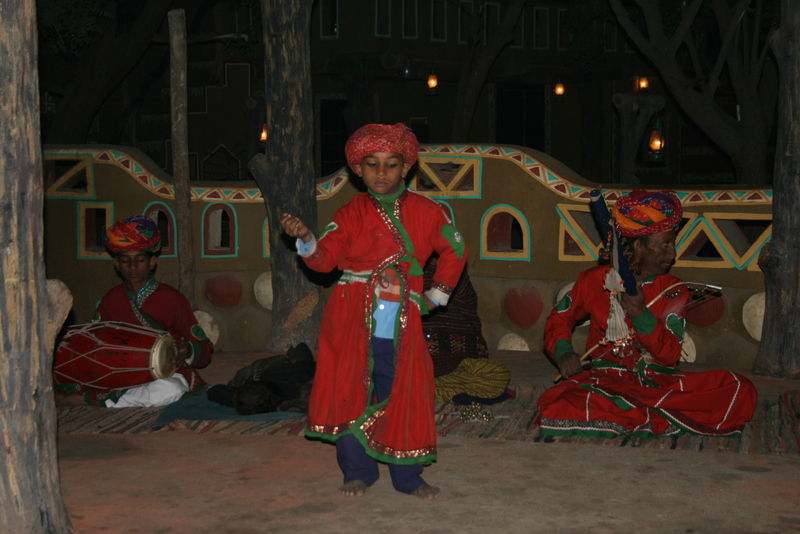 The visit includes an entire evening of entertainment and dinner t a choice of original restaurants serving Rajasthani food in the traditional way – large chairs, lavish cutlery and serving practices. I feel like royalty and settle down to a great meal, watching the musicians and dancers perform. Then I wander through the village, I can take a camel or elephant ride (no thank you), shop for ethnic spices and clothing, weaving or just sit under the moonlit sky in a huge rocking chair built for a queen. As I walk around the villagers ask me “mem sab” (honored one or beautiful lady – depending on who says it – to join their dance, play an instrument , and many ask to take my picture. They are beautiful people both physically and soulfully, and I enjoy my time there until the driver appears and we head to the hotel to rest up for the tons of sightseeing tomorrow. 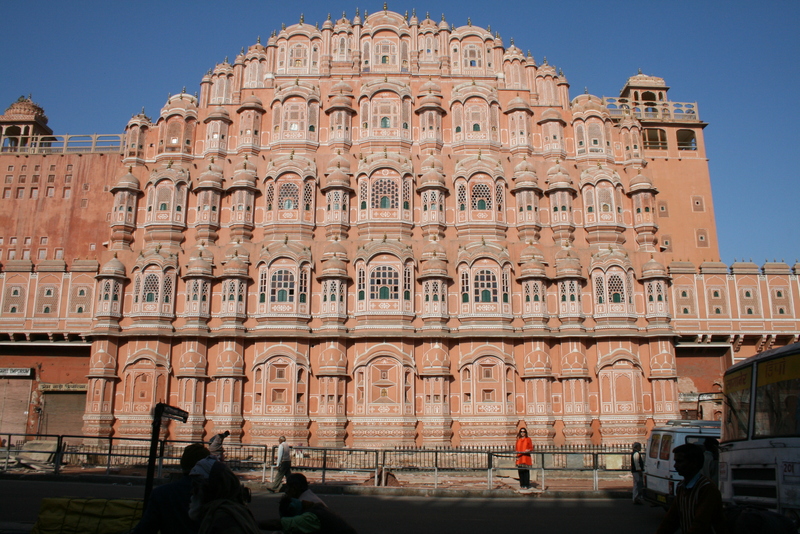 After meeting my guide, a very charming and knowledgeable man we drive to the Hawa Mahal for pictures, then on to the Amber Fort to see the wall and the palace buildings and to photograph the elephants . 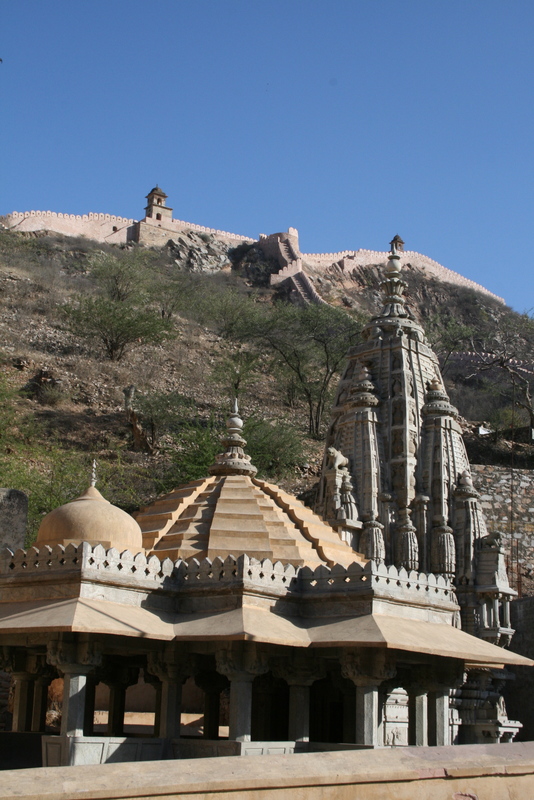 We climb the steps to the fort since I refuse to ride the poor elephants, overworked by thousands of tourist rides all day long, and marvel at the breathtaking views from the top, overlooking the entire city. This fort is a wonder and looks a little like the Great Wall of China it has been compared to. It was built in the 16th century and is indeed amber in color. I walk down to the court to see the majestic elephants in all their glory and stop to stroke the trunk of one who has no riders on top. She looks at me sorrowfully and I can’t believe my eyes but she is crying. I then hear a terrific thud and see a man beat another elephant over the head with an iron rod, the noise is so loud everyone turns and I impulsively scream NO!!! . 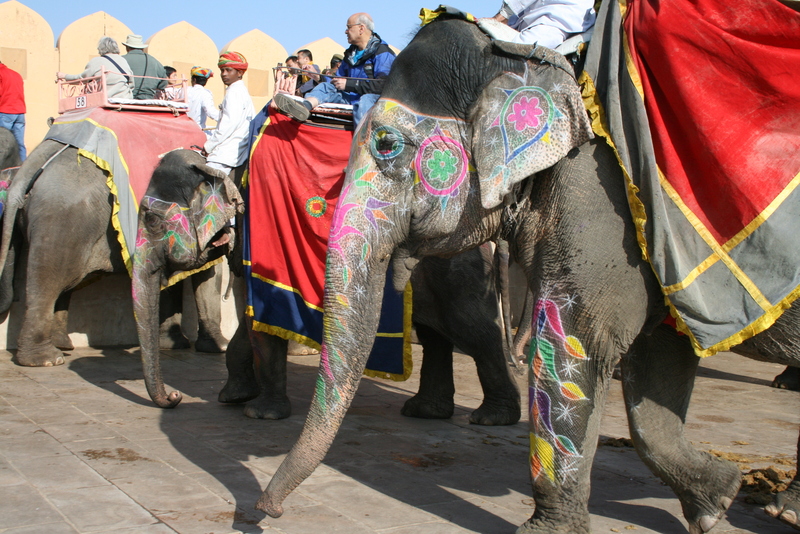 My guide tells me not to get involved, that there are animal rights activists trying to stop the use of elephants and camels for tourism. 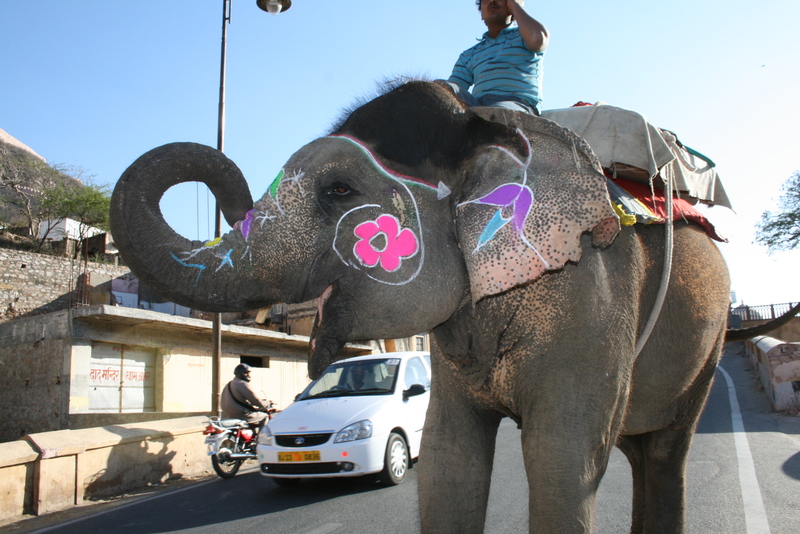 And yes he says, that elephant was crying as she was tired, hot and frightened. These 150 majestic creatures of God must work all day carrying tens of thousands of tourists to the top of the fort and bottom. 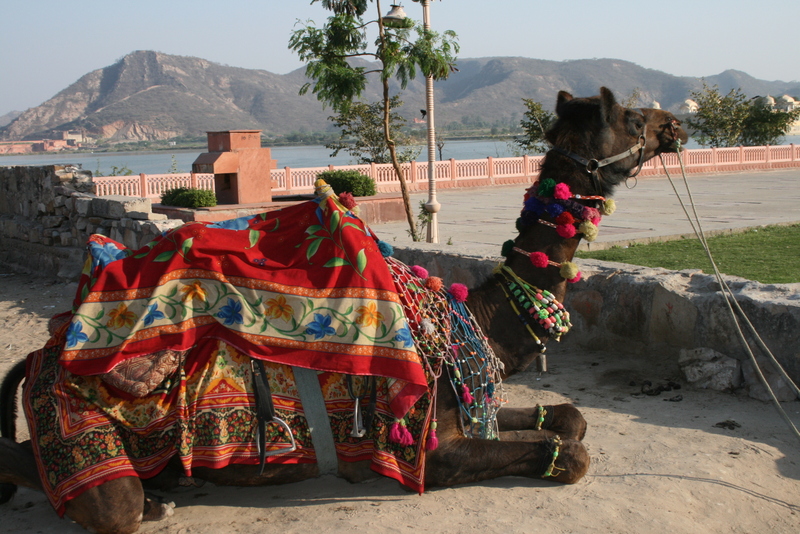 I ask if they are at least well cared for since the visitors each pay 700 rupees for a 10 minute ride and he responds that no, they are mistreated. I would think the opposite since this is their livelihood, but I am mistaken. I tell my guide I want to leave as soon as possible, my heart is aching and I can’t take another minute of watching this abuse. I can’t speak for a while and wander off to shoot some photos of the natural surroundings and then return to the car to see the City Palace, which is still home to the royal family of Jaipor. This is a remarkable building so well planned that even 400 years ago they recycled the water and even invented an “air conditioning” system for the heat and the cold weather. The place has 4 main gates, each representing a different aspect of the earth and the wildlife. 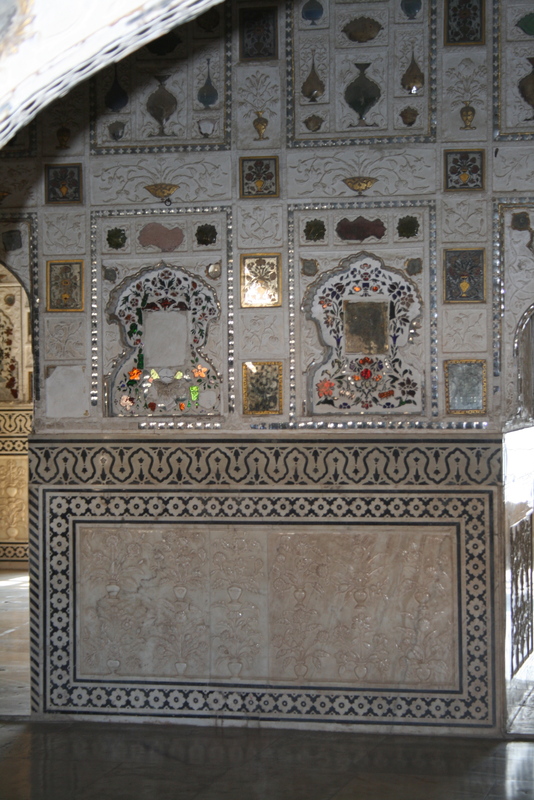 My favorite is the peacock gate, with crushed gems and vegetable coloring to decorate the ornate doors and wall with images of peacocks. The summer part of the palace has vents for sunlight to come into the building but it is then deflected to avoid getting too hot. 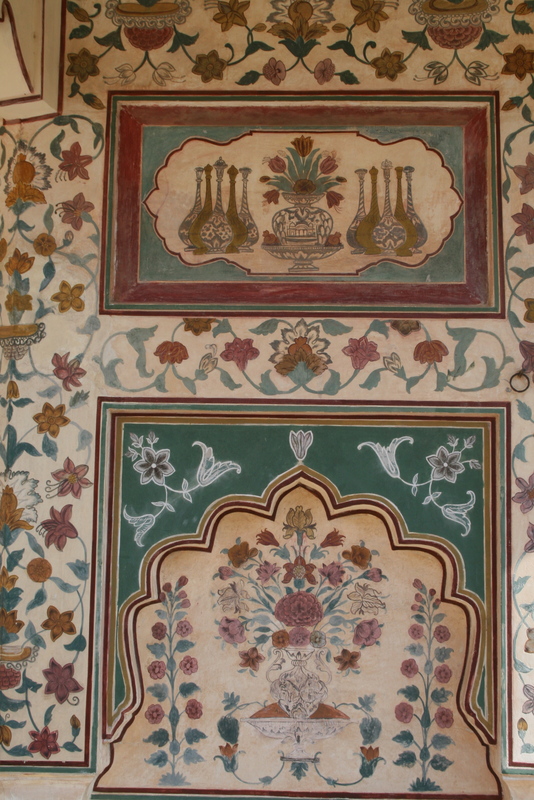 There are terraces where the Maharani and maharaja sat at night to watch the moon and constellations and listen to their court musicians perform. Water from fountains was used as a mist mixed with jasmine and rose petals to cool the rooms, the scent must have been amazing and so romantic! Across from this end of the palace is the “winter” quarters where hundreds of jewel like mirrors have been geometrically cut in such a way that when a fire is lit inside the room, the heat is retained and there was no need for blankets. This engineering was introduced from Belgium and is both practical and gorgeous. 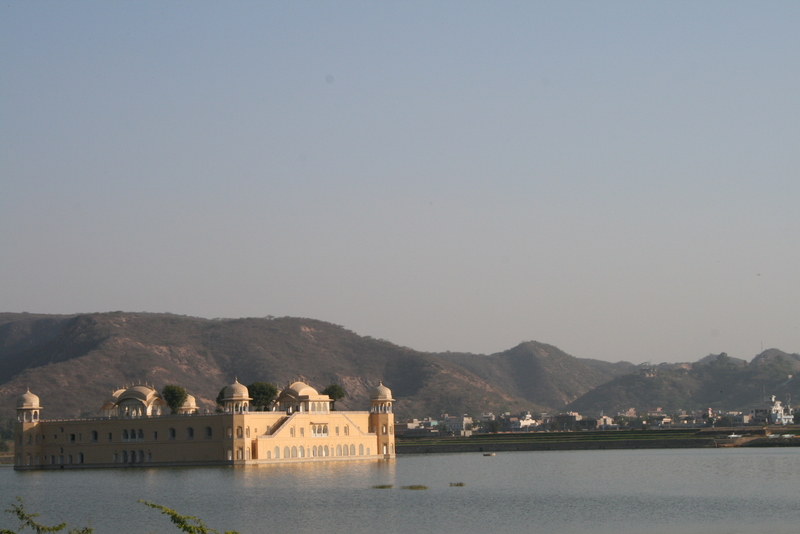 The maharani lived there until her death one year ago at the age of 94. She was said to have been the most beautiful maharani ever, and from the pictures I think tat is an accurate description. She is more beautiful than Ingrid Bergman in her heyday or even Grace Kelly. She was also a great benefactress and let out all the buildings to the families of the original artisans so that their craft of weaving and art, jewelry making will continue to be passed down to each generation. After speaking to one of the artists there, I find out that all of the family members of these royal artisans are given the studios for free to show their wars and work in them. The maharaja also used the funds from tourism and the selling of crafts to start and maintain several schools and homes for girls. 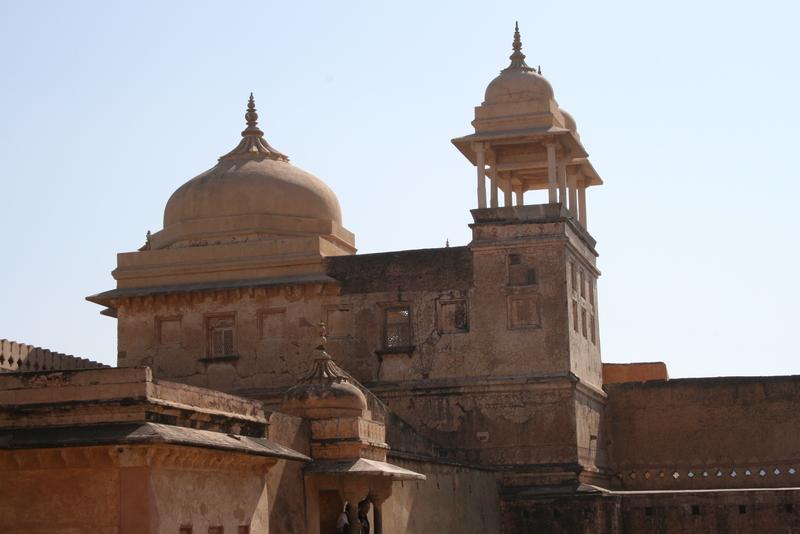 She was much admired and in all of India, this is one principality that has remained at their original palace and are still revered. 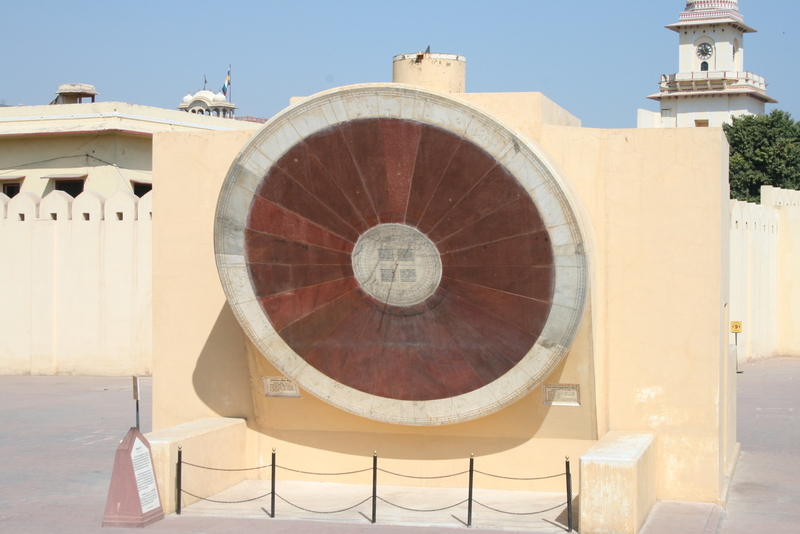 Next stop is the Mantar Observatory and museum which is a completely natural observatory containing a sundial that is accurate within 27 seconds. It is in the Guinness Book of World records . The sundial isn’t all though, there are other instruments that tell the phases of the moon and the constellations as well as astrological timings. When a child was born they were brought to the observatory to determine the astrological aspects of the timing of the birth. If I had the time, I could have had my entire chart completed just using the outdoor instruments, no computers as we use today. I then ask if we can just walk to a temple and a park to get a feel for the area that is “shop free” and my wish is granted. 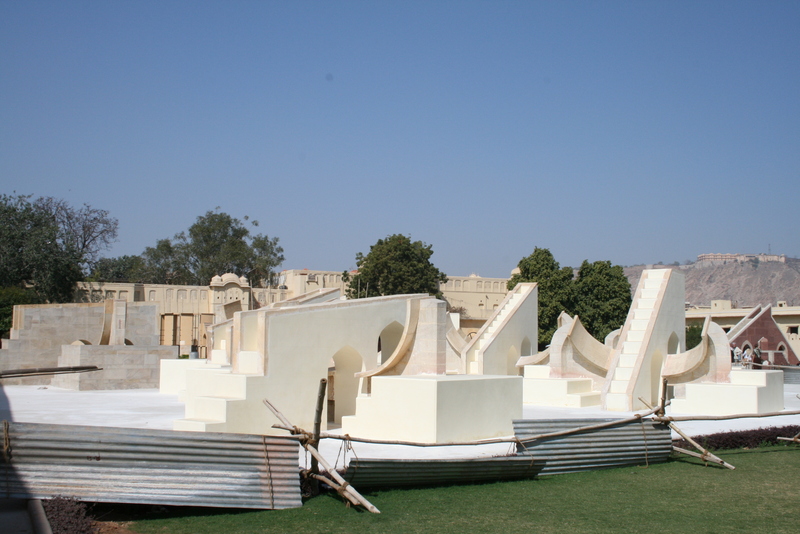 All over Jaipor there are gorgeous and well maintained parks and gardens as the Rajasthani people took their health very seriously and believed in fresh air and sun in tier daily life of prayer, work play and the practice of outdoor yoga. I can relax and stop thinking about the elephants for a bit. The day is almost complete and I have changed my flight – I will leave in the early morning instead of staying another full day. I am homesick for Udayan and want to get back to see the children for one more afternoon. After a lively dinner at an authentic dinner which includes entertainment by young Rajasthani musicians singing lyrical songs in beautiful voices along with two girls dressed in traditional colorful and gorgeous scarves and jewels who twirl with pottery on their heads and dance on swords (ouch), I am off to sleep so I can make the flight at 7 AM. I fly into Kolkata and go straight from the airport to Udayan for one last goodbye. As I arrive the kids scream and shout my name, surrounding me with hugs and kisses. They ask me to stay for lunch and I am called in and asked to be seated in the front of the dining hall. There I am presented with a giant garland of marigolds and a brass statue of the god Shiva. I thank them trying not to cry and ask that my words be translated a bit so the real meaning is understood. I tell them that it is they who should be thanked for allowing me the honor of working with them and for the way in which I was welcomed into the Udayan family. I am , forever there in spirit and they will always be in my heart. My tenure is over and I return to Kolkata to pack up and get ready for my late night flight on Saturday. One last party Shamlu says, so off we go again – isn’t this how it all started? I think your blog is great. I found it on Google. I am absolutely going to bookmark it. Flying through the air in a chair…..
Life, a painter’s palette…of course the journey continues! agree shampoo on The banging of the drum!